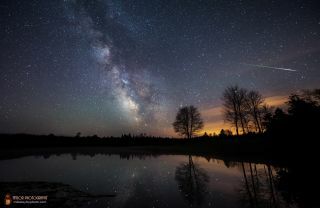 Astrophotographer Mike Taylor, who is based in central Maine, captured this photo of an Eta Aquarid meteor streaking through the sky on May 6, 2014. A meteor shower spawned by the famous Halley's Comet peaks overnight tonight (May 5), and you can watch and learn about it live during a free webcast from the Slooh Community Observatory. Tonight's two-hour Slooh show focuses on the annual Eta Aquarid meteor shower and features live night-sky views from several observatories around the world. You can watch the webcast at Slooh.com, beginning at 8 p.m. EDT tonight (0000 GMT on May 6). You can also watch the Eta Aquarids show at Space.com, courtesy of Slooh. "I'm excited to be reporting live from Slooh's flagship observatory in the Canary Islands, which is ideally placed for the Eta Aquarids meteor shower," Slooh host Paul Cox said in a statement. "With no moonlight to spoil the view, and dark skies protected by the Canary Islands 'Light Law,' this should be one of the best Eta Aquarid showers we've seen." Like other annual meteor showers, the Eta Aquarids occur when tiny pieces sloughed off by a comet slam into, and burn up in, Earth's atmosphere. The parent comet in this case is Halley, which last zoomed past Earth in 1986 (and won't do so again until 2062). Another debris stream shed by Halley causes the Orionid meteor shower, which occurs every October. Observers in the Southern Hemisphere are well placed to see the Eta Aquarids, but people in northern climes aren't so lucky. Viewers in the Florida Keys and southern Texas with dark, clear skies can expect to see about a dozen meteors per hour, while folks north of New York City will see few, if any, according to Space.com skywatching columnist Joe Rao. Good thing we can all check out the sky show on our computers! Editor's note: If you snap an amazing photo of an Eta Aquarid meteor, or any other night-sky view, and you'd like to share it with Space.com and our news partners for a story or gallery, you can send images and comments in to managing editor Tariq Malik at spacephotos@space.com.